Wanting to learn how to play Roulette, your best bet is to familiarize yourself with the game before wagering any money. The best way to do this is to enjoy some roulette free play, in a safe and secure environment. Playing the game is as easy as taking a guess. That’s what the game is all about, in it’s simplest form. Drop a little ball, in a little wheel (Roulette is French for "Little wheel") with numbered pockets and try to predict the outcome while wagering money on it. Getting the hang of all the different types of bets and such is a different ballgame, and that's what this guide is for. You and other players place chips (stake) on the table in sections that correspond to your guesses. Wait for the ball to come to a halt in one of the numbered pockets. The rules of roulette are simple and easy to understand both in land based and online casinos. As previously mentioned, it's a guessing game where you stake money on which pocket numbered from 0 to 36 you think the ball will stop in. To spice things up, there are different sections on the table you can place bets on, which have higher / lower odds. More on this later. A round starts with the croupier (title of the casino employee who runs the game) announcing "Place your bets please". After bets have been placed and the ball has spun for a while, the croupier follows up with a second announcement "No more bets please". Everyone must then wait until the ball stops and the winning number is revealed. Any winning players are then paid, promptly followed by yet a new round of Roulette. Land based casinos make use of colored chips. Each player has a different color, as this makes it easier for the croupier to distinguish bets from one another, and to which player the respective stakes belong to. Online casinos does make use of colored chips too, but in this case it's used to help players see the chip denomination (value). As the software automatically recognizes who's placed what bets, the process is much more speedy and simple. All rounds in Roulette start with the "Place your bets please" announcement. This is done by the Croupier, and only after that are you allowed to place your bets and chips on the table. It's time to put money on your lucky number (or section)! There are different kind of sections to bet on in Roulette. The most used and famous ones are the normal "straight up" numbers from 0-36, and the classic "Red" or "Black" bets. Other roulette bets include Split bets, Corner, Street bet, Line bet, Column bet, Dozens Bet, Odd or Even bets and High or Low bet. Get to know the different types by having a look at our "Roulette Bets" section further down this roulette guide. Before "No more bets please" is announced, players are busy placing their bets. The Croupier starts spinning the wheel, and does it the opposite direction of the previous round. The Croupier then places the ball in the wheel and spins it the opposite direction of it, once the winning number from the previous round is passed. Once this is done, you'll hear "No more bets please". Note that any bets placed after this announcement will be deemed invalid and returned. The ball will eventually start to lose momentum, and as a result drop down to the pockets and bounce around due to the sprockets. A classic moment, and the very definition of the excitement that this game brings its players where those playing try anticipating where the ball eventually settles. Once the ball has stopped moving and settled in a pocketed number, the Croupier announces the winning number, and shows it by placing a marker on it. In online casinos, the winning number is automatically revealed on the screen. After the winning number is announced, lost bets are collected, while winning ones remain on the table. In land based casinos the Croupier starts stacking up chips to match your bet and winnings, before pushing it towards your place at the table for collection. Online Roulette gives players the option to repeat their bets with the click of a button. If you want to repeat your bet on land based casinos, simply let the croupier know that you want your stack to remain where it is, before they give you your winnings. Note: Many online casinos offers players a "double" option. This option comes into play if you've repeated your bet, and lost. It gives you the choice of keeping the exact same bet, but doubling your stake. When wanting to learn how to play roulette with real money, chose the European variants over the American one as this will cost you less over time. This has to do with the odds, where the European variants gives the house an edge of 2.70%; nearly half that of American which is 5.26%. How come such of a big difference? The answer to that lies in the extra pocket in American Roulette called "Double Zero". This also means that different house edges dictates different odds of winning. Example 1: As an example, we use color red, and we make a €1 bet on it. On American roulette, odds of hitting that is 46,37%. The European variant offers the same play for 48.6% chance of hitting. Example 2:The odds of hitting a single number in American roulette is 2.63%, where as European has 2.7% for straight up bets. 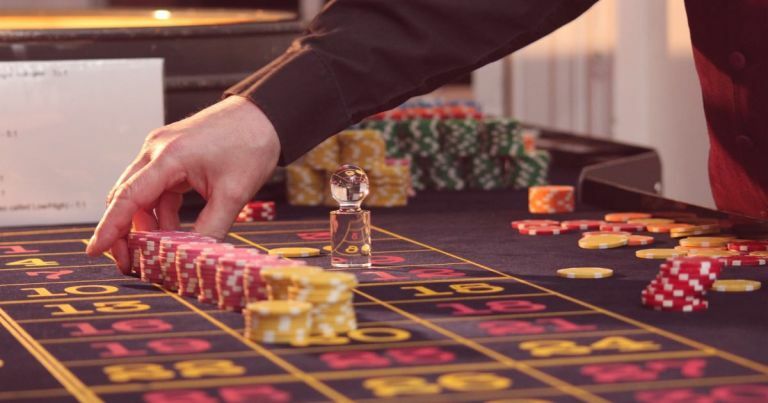 It might seem of an insignificant difference at first, but once you've experienced it first hand, you'll probably want to stick with the European / French Roulette tables. Especially when wagering real money. Outside bets are bets placed outside of the numbered section on the Roulette table. Inside bets are wagers made on the sections in the number area of the Roulette table. Please note that inside bets differ slightly in odds between the European / American variations. This is because the American one allows you to place bets on extra combinations which are not found in European nor French Roulette. Both American and European (including French) Roulette offers the same type of inside bets, with the exception of "Top Line" and "Basket" which are only found on the American variant. These bets are essentially stakes wagered of numbers 0, 00, 1, 2 and 3. Roulette doesn't have too many rules, and as such is not a complicated game to neither understand nor play. Keep in mind though, each table has its own wagering limits. Depending if it’s a normal table or VIP table the minimum/maximum bets could change from €1 to €10000. The Croupiers are happy to guide you trough any differences of the table should there be any special conditions or rules at play where you decide to sit down. If you're wondering about anything, have questions or simply need help - let them know, and they'll gladly assist you. Different casinos have different Roulette variations on offer, in addition to their normal variants. Spotting the difference between these might be a minor challenge for inexperienced players. Learning the difference between these is a must when wanting to learn how to play roulette . Most online casinos however (especially those licensed in the UK / EU) prefer the European / French variations. Make sure you pay attention to what kind of Roulette you're playing before wagering your money. This helps you lose less, and also steer clear of any confusion due to misunderstandings of the action and / or rules of the game. Variations are not huge, but you should still know them. Bonus tip: A part from the 3 standard variations of Roulette, you should be vary of trying other, more "fancy" variants. In most cases, the house edge is bigger in these games and thus you'll lose more over time. If you simply want to experiment and have some fun though, go ahead. The difference between French Roulette and European Roulette is minuscule. European roulette tables have a wheel at the end of the table, whilst the French ones have two layouts and the wheel in the middle of them. Most famous and popular form of Roulette worldwide. French roulette has rules, which other roulette versions do not have. These rules are named as ‘La Partage’ and ‘En Prison’. The "La Partage" rule comes into play if you've placed bets and the green zero lands instead of your numbers. This happens from time to time, and when it does players will be refunded half their bet. The "En Prison" rule comes in to play when you've bet on "outside", and the green zero lands. If that is the case, your bets are "imprisoned" and stays on the same section until the next round. Quick fact: A funny difference between European Roulette and French Roulette is that the French version is usually always in the French language, regardless of where in the world game is played. The "Double Zero" pocket is what separates American from French and European roulette. That pocket alone gives the house double the edge compared to the other variations. Other than that, the American version of this classic table game is the same as the others. Online/land-based variation Racetrack: Some of the land-based and online casinos have the special bet ‘’map’’. This ‘’map’’ could be also called ‘’Racetrack’’. On these ‘’maps’’ you can do special bets like Orphelins, 0-Spel, Tiers and Voisins. With these special bets, you can cover most of the numbers without putting the money literally on the numbers. Roulette is a fantastic game in the sense of how you can play it. It's all about guessing, and how you chose to wager money on your speculations is completely at your liberty as long as you follow the Croupiers instructions. We'll discuss the 3 most common Roulette strategies used by players at the bottom of this section. Bet on whatever you feel like. A lucky number perhaps? Birth- or other important dates? It's up to you. Maybe your favorite color is red, or black, even green. It doesn't matter. The game of Roulette is a game of chance, and thus there's no real nor working strategy that allows you to beat this game over the long run. This is simply due to the fact that the game is rigged in favor of the Casino. In European Roulette there's 36 numbers. Yes, covering all of them will net you a win for sure, but not without losing as the payout is 35 to 1. In essence, you'll lose 1 chip pr. round. People have been trying to "beat the game" since the early days of its creation. It's not possible. Land based casinos makes use of perfected equipment that is thoroughly tested before being allowed to accepts bets. This is done to keep players from exploiting any potential weaknesses. Online casinos make use of what is called a Random Number Generator. This is also referred to as an RNG. It's a piece of software that generates a sequence of numbers or symbols that dictates the outcome of the rounds played. The results can not be predicted and Random Number Generators used by licensed and regulated online casinos are impossible to exploit as their software is audited by independent third parties. These audits are mandatory and allows the third parties to test and verify the results - ensuring safe and fair play. The Martingale system is the most commonly adopted strategy in all forms of gambling. However, it doesn't take into account maximum bet limits, or any other rules. The system is simple, which possibly explains why it's so popular. It's only applicable on even money bets. How does it work? Place a bet on an even money result. If you win, you change nothing. If you lose, you repeat the exact same bet but doubling your stake. Keep doing so until you've won back what you've lost. Sounds genius and simple enough, right? Wrong. What if you bet on "red", and "black" comes 10 times in a row? This system is more "safe" than the Martingale system which has a steep progression, and is also only applicable to "even money" bets. What is the Fibonacci system? It's a natural occurring, mathematics and scientific sequence of numbers. Say what now? Ok ... It's a sequence of numbers where the next number in the sequence equals the sum of the previous two. Decide how many rounds you want to play, and translate this to a Fibonacci sequence. Always starting at 1. If you win, start over again. If you lose, continue down the sequence until you've won. Once you win further down the sequence, move back two numbers - and keep playing untill reaching the end of the sequence. This strategy is safer and more reliable than the Martingale, but in the end it won't work. After all, it's just a sequence of numbers telling you how to bet. You might have seen this video from YouTube, where this guy has sold everything that he owned, gathered $136,000 a played everything on one spin in Roulette. Double your money or a new life as a homeless person without any money. A common strategy often seen being introduced to the game late nights / early mornings when having one too many drinks. Don't do it. Just don't.